Heat grill. In small bowl, combine all mustard sauce ingredients; mix well. Cover; set aside. With small metal spoon, scrape underside of mushroom caps to remove dark gills and stems. Cut each cap into 6 pieces. Alternately thread mushroom pieces, onion, tomatoes and artichoke heart quarters onto two 12 to 14-inch metal skewers. Brush with artichoke marinade. When ready to grill, place kabobs on gas grill over medium heat or on charcoal grill 4 to 6 inches from medium coals. Cook 8 to 10 minutes or until mushrooms are tender and onions are crisp-tender, turning and basting occasionally with marinade. Serve kabobs with mustard sauce. 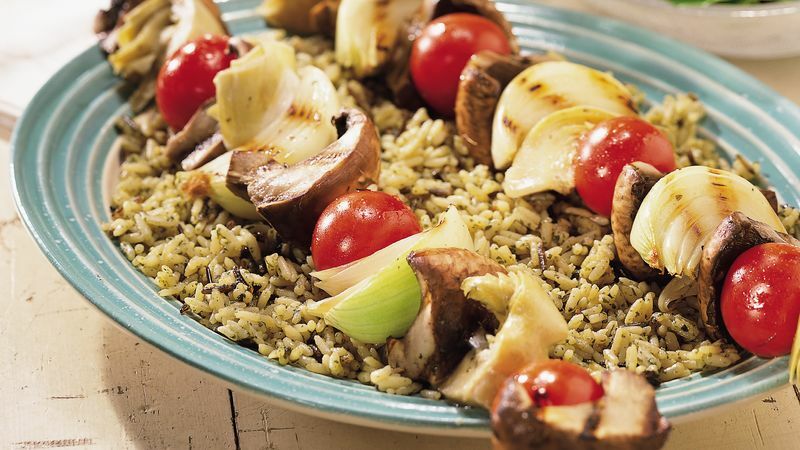 Portobello mushrooms are mature cremini mushrooms, which are a light brown variety of button mushrooms portobellos have a hearty texture that resembles meat in these vegetarian kabobs. Use only the caps from portobellos; remove their tough woody stems and save them to simmer in soup stock. Add the remaining artichoke heart s to pasta, a sandwich or a tossed salad.